California has 13 recognized 14,000 foot peaks, there are 10 other high points/sub peaks in California that are not recognized as distinct 14,000 foot peaks. Mount Whitney (Keeler Needle, Day Needle, Third Needle and Aiguille Extra) Mount Russell (East Peak), Mount Williamson (East Horn and West Horn), North Palisade (Starlight Peak and Polemonium Peak) and Mount Shasta (West Summit) have sub peaks that are well above 14,000 feet but due to their proximity to the main summit and elevation increase from the bridging saddle do not meet the criteria of a fourteener. To complicate things further some people say there are 15 14ers. There are three distinct ranges that holds these 14'ers, the Sierra Nevada with the exception of Mount Shasta (Cascade Range) and White Mountain Peak (White Mountain Range). All this makes California one of the best climbing areas in the world. Many are very easy to get to with many within driving distance of LA or San Francisco. Some require overnight backpacking trips and are well worth the effort. Late June through mid September are the most popular months with thousands of people on the hills. A lottery system is used to issue permits for some including Mount Whitney. If you want to avoid the crowds don't take the "standard" route. In fact the secondary routes are often much more interesting and rewarding! While it may seem simple to load up the car and go "climb a 14'er", it can be deadly. Every year people die on these mountains. Thunderstorms with lightning, sudden snow squalls, high winds can turn a great day into a nightmare; so be careful and always consult the NFS and the latest weather and avalanche danger before going up. The following table lists the 15 with the ones I have climbed in bold. These have links to pages about that particular climb with a short essay, videos and pictures. The indicates one of my favorite 14ers thus far. * the peak is not more than 300' higher than the adjacent 14er thus not considered a "real" 14er but still climbed by most going for all the California 14ers. ** Whitney's elevation is of conseriable debate. The most recent measurement is 14,505' but the summit plaque shows 14,497.
note: route difficulty is determined by the most difficult section so a route can have 50 feet of Class 3 and 6 miles of Class 1 and be classified as Class 3. Trail hiking. Mostly groomed trails that are easy to find in the summer and relatively smooth. Walk upright without use of hands for balance. It can be a little steep at times. Mount Elbert, the highest 14er, is Class 1 on the standard route. Simple off-trail hiking. Some scrambling may be required on the route with an occasional use of the hands for balance. Downclimbing is straightforward.This picture is of Mt. Whitney's MR Chute, a class 2 route requiring some hands for balance. This is actual "climbing" since you scramble a lot frequently using your hands. Handholds are easy to find. You can downclimb facing out from the rock. Mt Whtney's Mountaineer Route is rated class 3 but like most routes it is easy class 2 most of the time with the upper sections becoming more difficult thus making the route a class 3. Simple climbing, with exposure. You must look for handholds and test them that they will hold you before using. You use your upper body muscles. A rope is often used for downclimbing (rappelling). Falls may well be fatal. The North Maroon Peak is class 4 with the traverse from South to North rated low class 5 on the upclimb on the North Bell. See my video of climbing this section. 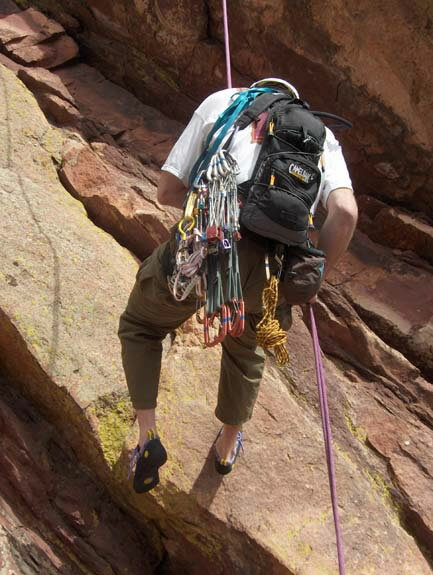 True technical climbing normally using ropes, carabineers, anchors (protection), harness, etc. Climbers often belay one another. In the winter you use an ice axe and crampons. Long's Keyhole route is rated "technical" in the winter beyond the keyhole since an axe and crampons are used. There are sub-ratings for class 5 ranging from 5.0 for "easy" climbs with frequent hand and foot holds to 5.13 that is has smooth and vertical rock on an overhang. There are an almost unlimited number of class 5 routes on California 14ers plus other non-14er climbs such as the Flatirons and Monastery near Estes Park.